2. 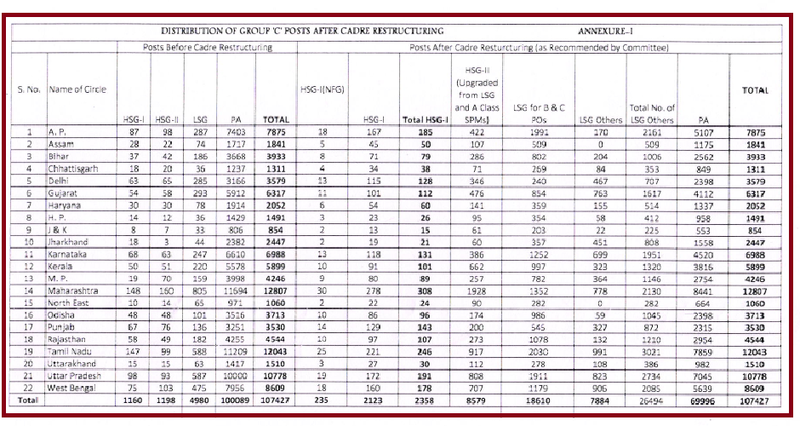 Issues like norms for allotment of number of LSG posts, instructions for identification of surplus LSG posts other than C and B class POs, identification of HSG-I (NFG) posts, divisionalisation of LSG Cadre, relaxation of minimum qualifying service for promotion to HSG-II and HSG-I and date of effect of the orders etc. needed further clarification. 3. Therefore, on representation of various Staff Unions to the Secretary (Posts) regarding the issues arising out of implementation of Cadre Restructuring, a Committee was constituted vide Office Order of even number dated 09.06.2017, under the Chairmanship of Sh. Charles Lobo, CPMG Karnataka Circle and DDG (Estt), PMG (M&BD), Chennai and PMG, Pune Region as its members to examine all such issues. The Committee after thorough consultation, including one with the staff representatives, submitted its report on 22.09.2017. (i) Treasurer posts should not be identified for upgradation as Treasurer posts are PA posts with special cash handling allowance. (ii) The posts of System Administrator, Marketing Executive, DO (PLI) etc. are not cadre specific posts. Therefore, any suitable official can be deployed against these posts. (iii) As per the Recruitment Rules, the PAs of Foreign Posts are recruited separately and trained for Foreign Post. But on promotion to LSG they are transferable to other LSG posts on postal side and vice versa. Hence extending the benefit of cadre restructuring to officials of Foreign Post in LSG and above cadres is in order as far as foreign post is concerned. Only Mumbai Foreign Post is treated as separate Foreign Post unit. (iv) The present cadre restructuring order is not applicable to RLO. Hence RLO staff should not be included in cadre restructuring. (v) After upgrading C and 8 class SPM posts to LSG remaining LSG posts allotted to the Circle can be utilized as per functional requirement. The officials occupying these restructured LSG posts will have either or both supervisory and operative responsibilities as per allocation ofwork by competent authority. (vi) The SPMs posts of C and B class post offices are upgraded to LSG without following the LSG norm of 5:1. Therefore, it is not practicable to prescribe the norm for other restructured LSG posts. Number of posts to be created in each office will be as per functional requirement. (vii) Accountants are Postal Assistants only who have passed the PO & RMS Accountants examination. They are eligible for promotion as per Recruitment Rules. Norm based LSG accountants posts can be upgraded to HSG II within the number of posts allotted to the circle. (viii) The post of Accountant in Divisional Office can be upgraded to LSG. If there is more than one post of Accountant in HPOs, some may be upgraded to LSG while leaving some others for time scale Accountants. (ix) More Posts may be identified in bigger offices like HPOs and MDGs. It is not possible to specify the number of posts as the staff strength and functional requirements vary from office to office. Thereafter PM Grade-III/HSG I pre restructured HPOs may be given preference for creation of posts. PM Grade II/HSG II HPOs, PM Grade III/HSG I MDG, PM Grade II/ HSG II SO/MDG, (all pre restructured) may be preferred for creation of posts in that order based on functional requirement. Circles should ensure that the posts are not disproportionately concentrated in a few offices/cities. (x) In charge CPC, Foreign post (except Mumbai Foreign Post), PSD and CSD or other offices can be considered for upgradation of posts to LSG. (xi) If Circles are left with surplus LSG posts, then limited number of posts in Divisional Office and important delivery offices may be identified for upgradation. (xii) All the posts of SPMs in B and C class offices should be upgraded to LSG and all LSG norm based and A class offices should be upgraded to HSG II as a result of the implementation of the orders. 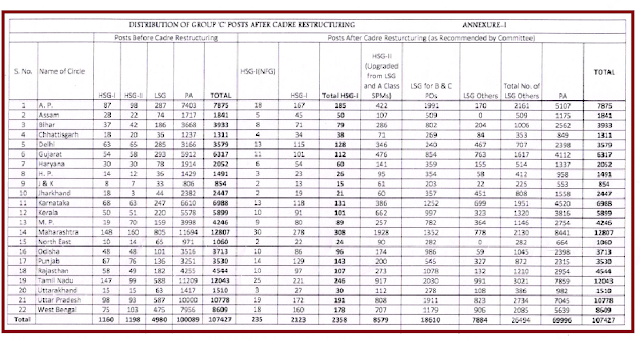 4.2 Identification of NFG posts in HSG I: Only 10 percent of HSG I posts i.e. 235 posts have been approved for NFG scale. Therefore it is not possible to promote all HSG I officials who are completing 2 years of service in HSG I. Although there is need to identify these posts for promotion from HSG l, in order to avoid inconvenience to staff in the initial stage and purely as a temporary measure, the officials can be given NFG on the basis of seniority wherever they are posted in HSG l by upgrading the HSG I post to NFG and simultaneously downgrading the NFC position to HSG-I elsewhere. In due course of time the posts need to be identified. 4.3 LSG Cadre: The Committee examined the issue of Divisionalization of LSG Cadre. The Committee observed that there are some mofussil Divisions which have more B and C class offices now upgraded to LSG but are having very less HSG II and HSG I offices. On the other hand there will be city Divisions where the number of B and C class post offices now upgraded to LSG are very less. Divisionalization will provide less opportunity for staff of these divisions to get LSG promotion and in turn affect their HSG promotions. The Divisionalization will create promotional disparity between employees in different Divisions. Therefore, the Committee’s recommendation not to Divisionalize LSG cadre has been accepted. It will remain a circle cadre. However, for better management of transfer and postings and to minimize inconvenience to the staff, Circle would allot officials to Regions for further allotment to Divisions, which in turn shall issue the posting orders in case. of the LSG officials and rotational transfer orders thereafter till such time that they remain allotted to that Division by the Region. At any time the Circle or Region may allot these LSG officials to any other Region or Division respectively. 4.4 Revision of Leave Reserve (LR) strength consequent upon upgradation to LSG. It has been observed that consequent on cadre restructuring the LR strength would be considerably reduced. The Committee observed that the postmaster in restructured LSG grade working in B and C class offices have to do operative work. Similarly restructured LSG PAs in other post offices have to do operative/supervisory work. Therefore, the Committee’s recommendation that considering the PA strength and the restructured LSG strength for calculation of LR strength will be in order, has been accepted. 4.5 Date of Effect of the Orders and completion of restructuring: For the sake of uniformity, the promotion will be effective from the date of issue of the original order dated 27.05.2016 as per existing instructions on the subject. It will be applicable to all eligible officials including those who were in service but now retired. 5. The rationalization of posts, as recommended by the Committee and accepted by the Competent Authority, is attached as Annexure-I. 6. In view of the above, all the Circles are requested to take immediate necessary action to implement the Cadre Restructuring of Group ‘C’ employees, keeping in view the above instructions without any further delay. All attempts should be made to complete the exercise of conducting DPCs by 31.12.2017 and the whole exercise, including transfer/posting Orders, must be completed by 31.01.2018.